Drain and rinse the black eyed peas, black beans, and corn. Add to a large bowl. Dice the tomatoes, making sure the seeds and insides are removed. You want to do this to make sure that there isn't too much liquid in the dip. Add the diced tomatoes and cilantro to the bowl. Slice the green onions finely and add to the bowl. Dice the avocado and squeeze a little of the lime juice over the avocados so they don't brown as quickly. Squeeze the rest of the lime juice into the bowl. Add the Italian dressing and stir to coat all the ingredients. Add salt and pepper to taste. Chill in the refrigerator until cold and flavors have marinated together. This is best served the same day as prepared. Serve with tortilla chips. 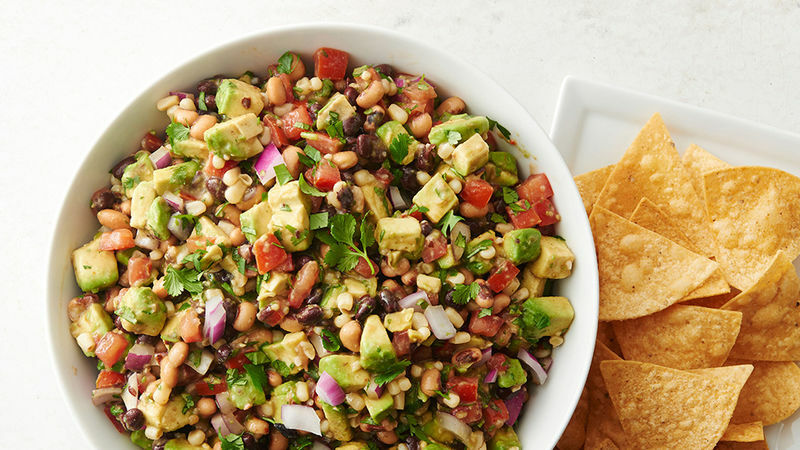 Cowboy caviar dip is the hit of any party you bring it to. Do you even need the chips? It’s so good, you could pretty much eat it with a spoon. Better yet, put it over rice, add some grilled chicken, and you’ve got yourself a lunch that’s easy to pack. It would also be great salsa to serve with meat, fish or tacos. Basically, if you can dream it, you can eat it. Cowboy caviar is the best and we want to put it on everything.